The No. 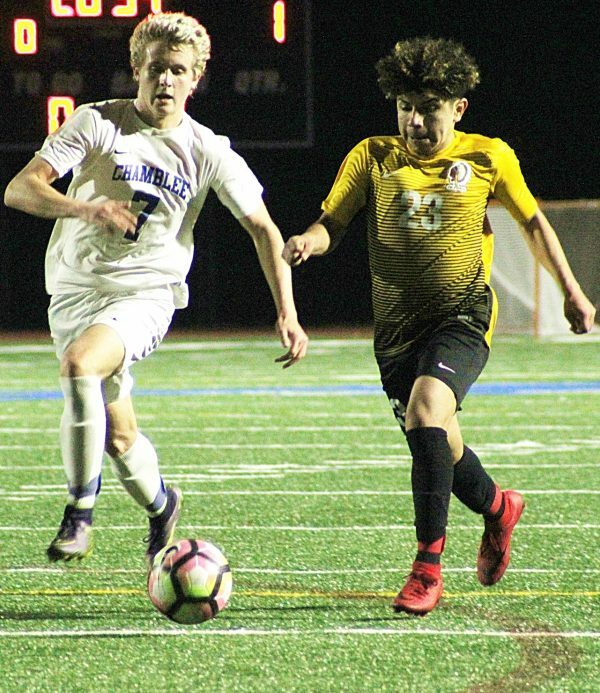 9 ranked Cross Keys Indians scored nine unanswered goals on the way to a 9-1 win over the Chamblee Bulldogs in a Region 5-5A and county rivalry at North DeKalb Stadium on Friday night. 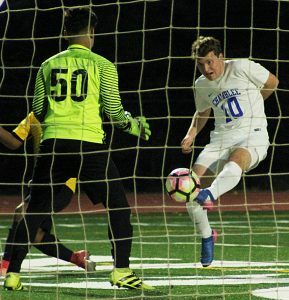 As chants rang out and the sounds horns blowing from a raucous crowd at North DeKalb Stadium the homestanding Bulldogs (3-5-1, 3-2) took an early 1-0 lead as Ross Wills’ touch shot past Cross Keys goalie Francisco Ignacio found its way into the left corner of the net with just under eight minutes gone in the game. It would take almost three minutes of play before the Indians tied the game at 1-1 on a goal by Christian Nandi. It would be the first of nine unanswered goals by the Indians. The two rivals battled back and fourth over the next 13 minutes until a Bulldog penalty gave Nandi a penalty kick which he was able to put past Chamblee goalie Sean Czerwinski to give the Indians the lead for good at 2-1 with 16:54 left in the first half. Cross Keys would finish the half up 4-1 behind goals by Anthony Maldonado (10:47) and Marcos Diaz (3:50). The Indians wasted little time in adding to their score after the half as Eduardo Dimas fired from the left side past a diving Czerwinski to make it 5-1 with less than three minutes gone in the second half. Maldonado picked up his second goal of the game with 21:53 to play as his break away pulled the goalie out and his shot despite being deflected did a slow spin into the net to make it 6-1. Jose Vergara made it 7-1 before Dimas knocked in his second goal to make it 8-1 with 12:08 to play. Marcos Garcia closed out the scoring with a penalty kick score with 5:43 to play for the final of 9-1. The win by the Indians (7-1-0, 3-0) sets up a meeting with the No. 1 ranked Clarkston Angoras (8-1-1, 3-0) next Thursday at Hallford Stadium for the top spot in the Region 5-5A boys’ standings. Game time is set for 7:30 pm following the Cross Keys and Clarkston girls’ game set for 5:30 pm. 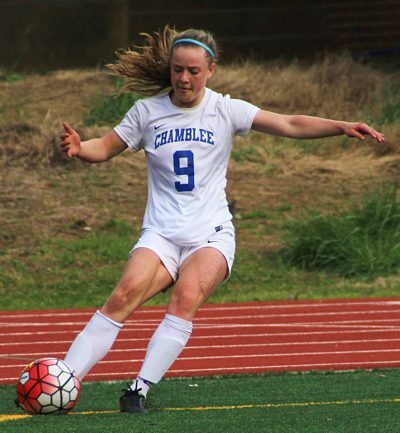 Teagan Furbish scored one goal and doled out 5 assists to lead the Chamblee Lady Bulldogs to an 8-0 win over the Cross Keys Lady Indians in Region 5-5A girls’ play earlier at North DeKalb Stadium. Chamblee (8-1-1) scored just 5 ½ minutes into the game as Furbish passed into the middle to a streaking Caiah Smith for the opening score. Furbish would come back to make it 2-0 just 38 seconds later as she went one-on-one with Cross Keys’ goalie Sandra Apresa to get the goal. The Lady Bulldogs offense put the pressure on Apresa most of the night with at least 28 shots on goal while the defense did not allow the Indians a shot on goal in the game. 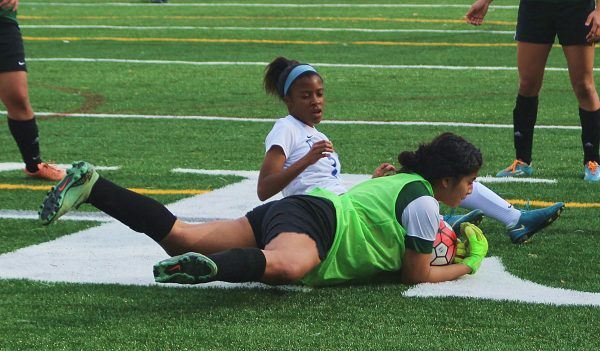 Apresa, who finished with 20 saves on the night, kept the Lady Bulldogs off the scoreboard for the next 15-plus minutes with some excellent shot deflections and diving stops. Furbish picked up her second and third assists in the game during a 3:17 span as the clock clicked down to under 19 minutes to play in the first half. She first tapped a pass to Meagan Woo from the right corner where Woo dribbled up and fired a shot into the far corner of the goal to make it 3-0. The next assist came as Furbish lofted a corner kick into the crowd at the front of the goal where Martha Wilber headed the ball into the goal to make it a 4-0 lead at the half. Chamblee quickly made it a 6-0 advantage coming out of the half as Paris Williams tapped a pass from Furbish into the net and Smith took a pass from Furbish on a break away for the sixth goal (38:57) with most of the second half remaining. Apresa continued to fight and battle the Chamblee offense holding them scoreless for next 16 minutes until coming down wrong on a nice leaping save and having to leave the game briefly. Chamblee took advantage of Jimenez’s absence as Woo passed to Savannah Lawrence with 22:24 to play to make it 7-0. Apresa would give up one last goal on a penalty kick by Williams with 18:10 to play for the final of 8-0. Chamblee improved to 5-0 and are stop the Region 5-5A girls’ standings with games against Miller Grove and Arabia Mountain remaining. Cross Keys is 2-1 in the region.